•	supporting its customers when submitting documentation to health authorities. 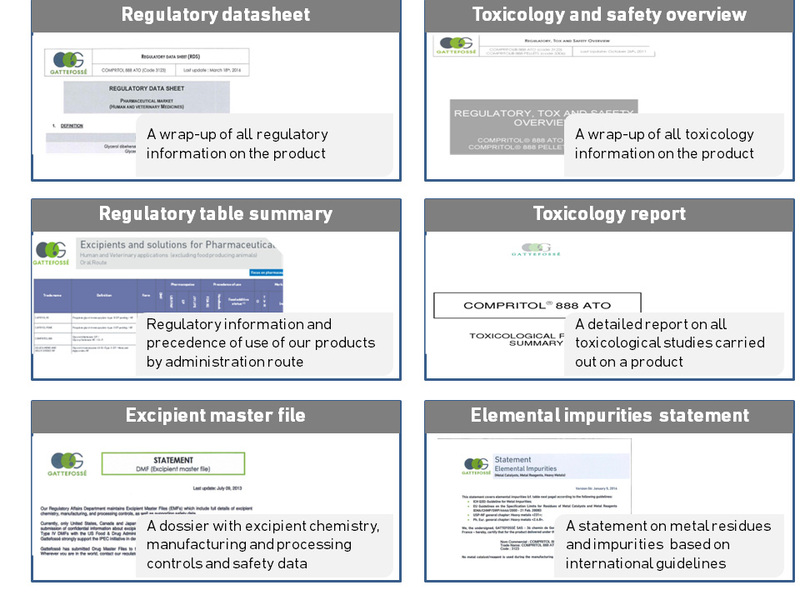 A regulatory data sheet is available for each excipient in the Product section of our website. This data sheet is a summary of relevant regulatory information, covering compliance to specific national regulations, safety, and precedence of use (FDA IID). Whenever monographs are revised, our customers are informed directly by our representatives and via notifications on our website so that customer are promptly informed of these modifications. Gattefossé provides its customers with comprehensive documentation regarding the intended use of its excipients. They can rest assured that our excipients are qualified to either meet or exceed international regulatory and compendium standards based on intended applications. Gattefossé is regularly audited by the French health authority (ANSM) in accordance with IPEC GMP guidelines. We are an active participant in initiatives to define regulatory and quality standards for excipient manufacturers and revise compendium standards. We have developed around thirty excipient monographs for lipid excipients over the past decades. This work relies on technical expertise in the development of analytical methods and the production of lipid excipients, as well as voluntary and transparent exchange of technical information between Gattefossé and American, European, and Asian pharmacopoeia councils. Our scientists are regular invitees to expert committees helping to define standards, revise definitions, and draft new compendium chapters. Active member of the EP board of “technical experts” (13H Fatty oils and derivatives) since 1990. Participant in a USP/NF initiative to create an informational chapter addressing excipient characterization and function. A guest member of the expert panel on Excipient Performance, Gattefossé assisted in the development of several sections of the corresponding USP chapter. Gattefossé is a member of IPEC in Europe, India, and China. IPEC aims to developing relevant guidelines for excipient manufacturers and the pharmaceutical industry. IPEC groups have worked diligently on guidelines for Quality by Design (QbD), Good Manufacturing Practice (GMP), and EXIPACT Certification. Sponsor of lipid excipients evaluation for inclusion in the EUPFI Safety and Toxicity of Excipients in Pediatrics (STEP) database. Gattefossé is pleased to be a partner in the improvement of global public health by helping to draft reference standards and monographs.